Early on in my faith, during my late junior high and early high school years, I used to have a tiny black Bible I would carry around with me in my back pocket. Being a young believer and hungry to learn, I would mark up that Bible every time I opened it – underlining sentences, circling words, and highlighting verses. If Paul called the Bible the “Sword of the Spirit” (Eph. 6:17), this was my smaller, swifter, dagger of devotion… or something of the like. For years I devoted myself to studying the red words of Jesus, the complex sentences of Paul, and the journeys of the Apostles in Acts. However, there was just one problem – that little black Bible was missing 39 books. Many of us have had at one point (or still carry around) a Bible similar to my little black one I used to own. 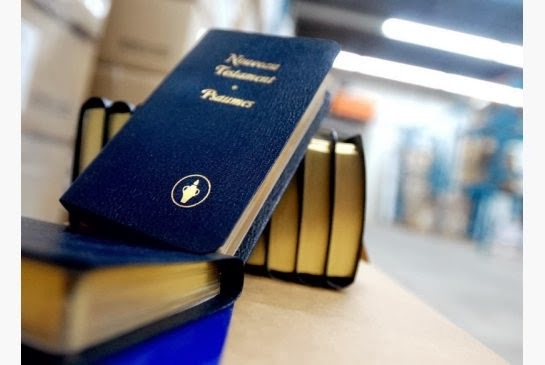 Maybe you were even introduced to the Bible through the small blue (or in my case, black) New Testament Gideon Bibles as the one pictured here. You learned about the Man of our Faith, Jesus, from the Gospels. You gained a greater understanding of the Good News from the Epistles. And you’ve marveled at what’s to come from the book of Revelation (not RevelationS ;). But you’ve also sat in wonder at those first 39 books of the Bible, which we deem the “Old” Testament, considering what to do with them. Why is this introduction to my New Testament so long? For many Christians today, the Gospel is powerful, the New Testament is life giving – but those first 39 books remain a mystery. Some think that the God of our New Testament Christianity has “changed” from the Old Testament, so if we really want to know who God is, read the Gospels. Some think that, since God doesn’t relate with people now like he used to back then, the OT is no longer relevant for us. Some (probably most commonly) have said that, in light of Jesus and the Cross, the OT is only necessary to show us our sin and point us to Christ. For most, the Old Testament is mostly an extended introduction into the real “meat” of the story of Jesus in the New Testament. Regardless of your view, or what you might have heard, it’s no secret that the Old Testament has largely been neglected from our modern day Christianity. Even if we were to venture into the OT, many of us wouldn’t know where to start, or how to even approach studying these stories of war, outbreakings of God’s wrath, and Laws about food and rituals. As a pastor, and an avid student of the Old Testament, it saddens – and frustrates! – me at how often we ignore the first 39 books of the Bible, and worse, how much the Old Testament has been mishandled by well-intentioned Christians and pastors. As a student in seminary, I came to love the Old Testament through one of my professors, Ken Way, and I continue to enjoy studying these 39 books as a pastor today. Maybe it’s the excitement of studying something with a new perspective from how I once learned these Bible stories; maybe it’s the mystery of uncovering truths in verses that are brand new to me; or maybe it’s the thought that after studying an Old Testament passage, my whole Biblical worldview will be expanded. Either way, I’ve come to look forward to studying the Old Testament in the way one looks forward to reading a new novel, or watching the latest episode of their favorite TV show. And I hope that many more can share in that joy with me. So, in the coming weeks, I’m going to devote my blogposts to looking at the Old Testament, considering how we should read it as New Testament believers, and hopefully impart a greater appreciation for the truths waiting to be uncovered in the “dusty” portion of our Bibles. Part 2: Corrective lenses: Reading the Bible like we “read” Art?